﻿﻿﻿﻿﻿Contact us about driftwood by filling in and submitting the contact form below, and we’ll attempt to get back to you as soon as possible. See our How to Order page to understand how we manage orders for our driftwood lots. 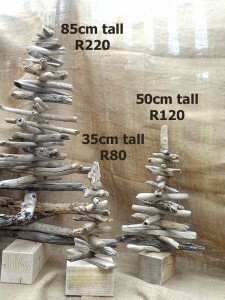 Driftwood Christmas Trees for sale in South Africa – ORDER FOR CHRISTMAS 2019! GET YOUR ORDERS IN IN TIME! It may take a day or two before an order is finalized. We post only on a Friday. If you first contact us on a Wednesday or Thursday it is very unlikely that we will be ready to post your parcel that coming Friday. We would only post the following Friday. Try to first contact us on a Saturday, Sunday, or Monday if you are hoping we can post that coming Friday. ORDERS FOR DRIFTWOOD CHRISTMAS TREES CLOSE AT 8PM WEDNESDAY THE 28TH OF NOVEMBER 2018. Apologies but we are getting several orders and we can manage only so much work. Next year try to order before the end of October! IMPORTANT! Please be sure to check your spam emails inbox for one to four days after contacting us! You might find our reply email there. Emails may sometimes end up in your spam emails folder when prices etc are mentioned. ALSO IMPORTANT! We work on a first paid first served basis. Prompt payment secures specific driftwood pieces just for you. We cannot and do not hold onto pieces that you are interested in for too long if you have not yet paid for them. Driftwood pieces are mostly unique and there may be another customer interested in those same pieces. Contact us about your special requests, about our driftwood pieces or about our driftwood products. Please note that we post only on a Friday (minimum postage (via Postnet in East London to another Postnet in South Africa) will be R99 and minimum handling and packaging will be R30). (The exact postage, handling & packaging price can only be worked out once we know your exact order). After posting at Postnet in East London, the parcel will take 2 to 4 business days to reach another South African Postnet. NOTE: We send parcels via Postnet to Postnet You order our driftwood pieces at your own risk. NO REFUNDS: We attempt to package carefully and give no refunds for any breakages or for missing parcels (we do email you a Postnet tracking number after posting at Postnet) or for disappointment in product. Our general “standard” not overly-exceptional driftwood pieces are mostly much like those in the three driftwood Christmas trees in the photo at the top left of this page. Sometimes we have some “special” pieces in stock – those will cost you more. Fill in the form above and then hit submit to Contact Us!